By “not necessarily him,” Gimenez clarified, he meant the game plan: that, working together with the Dodgers staff, Darvish had decided to minimize his curveball usage against the Astros—and, because of the subtraction of this non-elite pitch, the effectiveness of his other pitches, including the usually-elite slider, diminished. 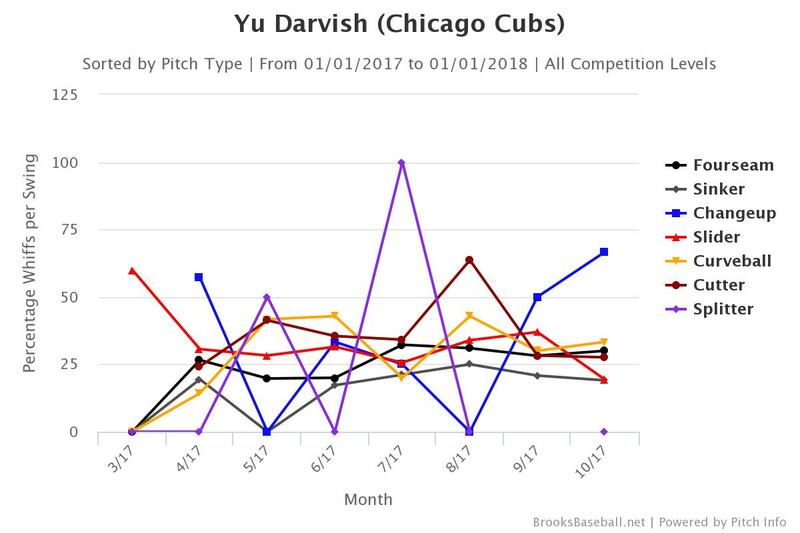 This theory intrigued me, and I set out to investigate whether Darvish’s curveball use over the course of the 2017 season and whether we can say this pitch made other parts of his repertoire more or less effective. Let’s begin with a season-long snapshot and zoom in from there. The first thing to note: Gimenez’s approximation of 6 percent curveball usage during the regular season is both accurate and specific to 2017, when it fell to 5.76 percent from 9.72 during Darvish’s partial 2016 season, representing the lowest rate of curve usage since his 2009 rookie season but more or less in line with the 5.81 percent in his sophomore campaign. (This drop-off is even more pronounced if you combine his regular and “slow” curve; he didn’t throw the latter at all in 2017.) As his pitch mix changed, both his slider (24.97 percent of pitches in 2017, up from 16.96 in 2016) and cutter saw significant increases in their use (up to 15.93 percent from 9.29). 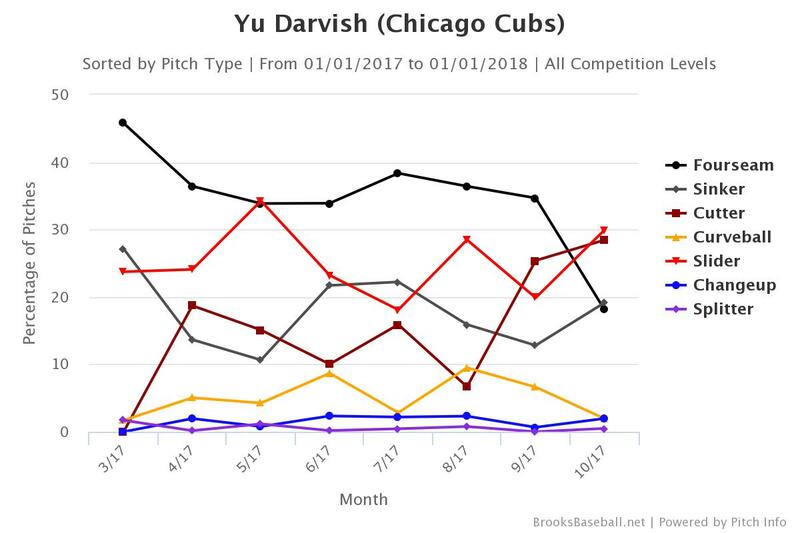 In short, it wasn’t just the postseason or World Series where Darvish reduced his curveball use: this was true of the year overall. 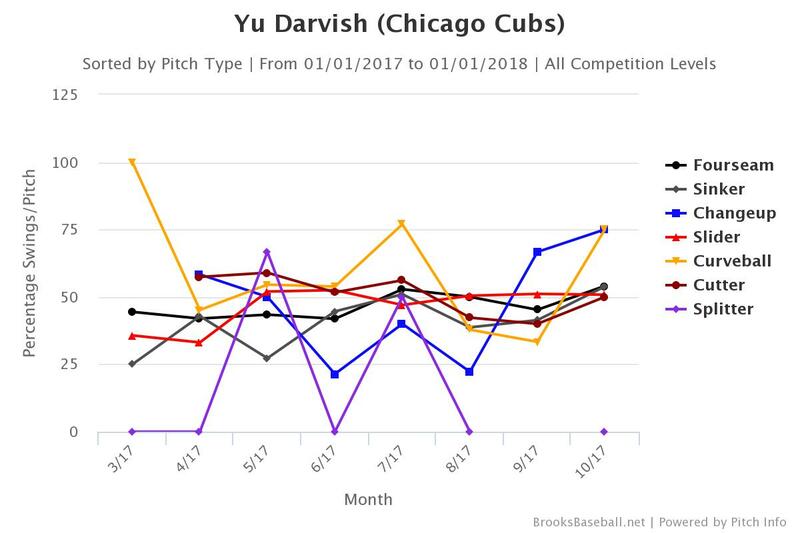 Darvish’s curveball rate actually bottoms-out in July and peaks in August, after his trade to the Dodgers, before gradually declining through the end of the season. The obvious question here is why. So I’m going to throw a few more charts at you and ask that you keep paying attention to July. In July, batters swung more and whiffed less; in August and September, they swung less and whiffed more. 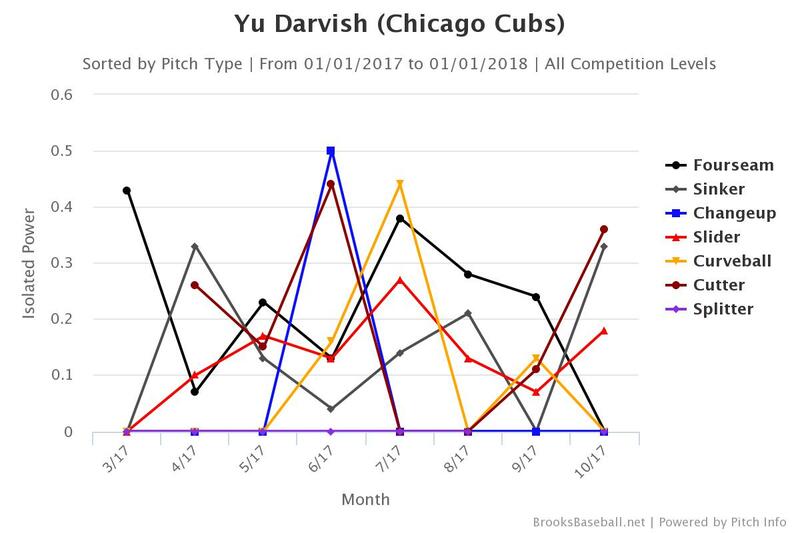 That is, it looks like Darvish’s curveball, in isolation, was less effective in July and used less often; after arriving in LA, he seems to have found the pitch—or at least its usual outcomes—again. 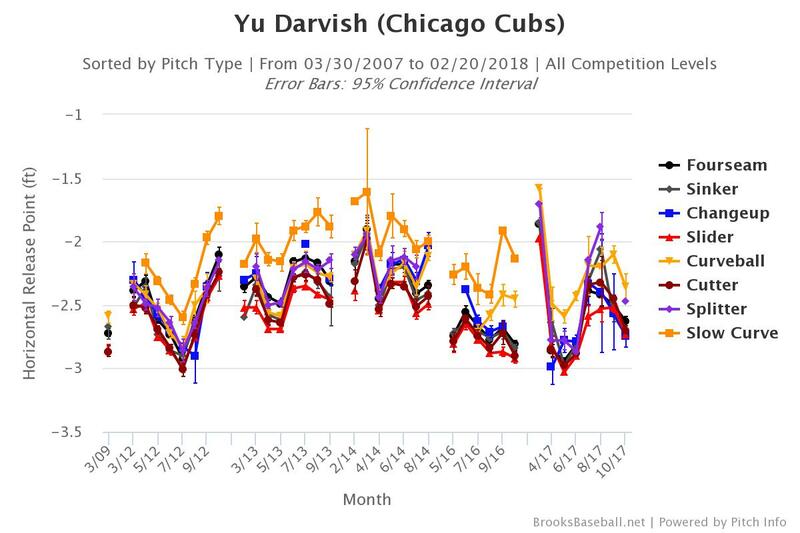 At the same time that Darvish’s curveball lost its ability to generate whiffs and called strikes and was thrown less often, opposing batters’ ISO against his two primary pitches—his four-seam fastball and his slider—hit their season peaks. Once the Darvish reintroduced his (more effective) curveball in August, ISO against the four-seam and slider declined. Still, I don’t think it’s as simple as a connection between the rate at which Darvish uses his curveball and overall pitch outcome effectiveness. 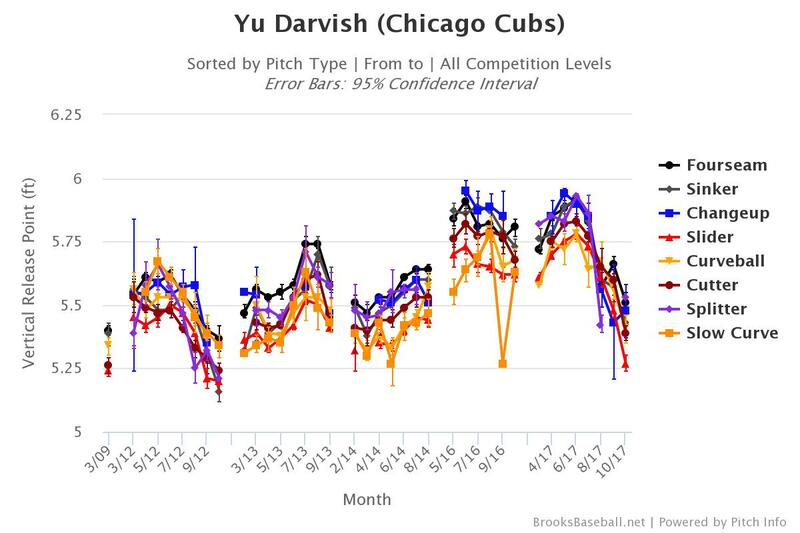 As Darvish’s curve use fell in September, so did opposing batter ISO. Darvish was still throwing the curve at about his season-average rate (exactly what Gimenez was talking about). 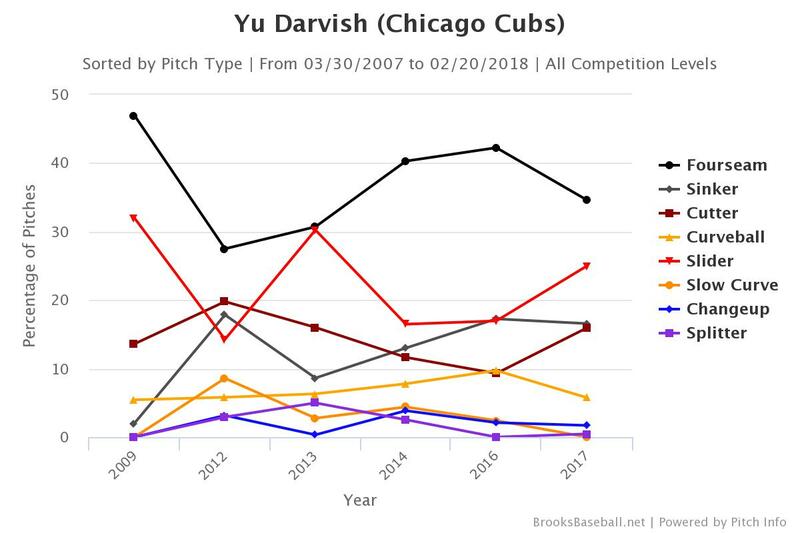 Rather, it’s that Darvish went from minimizing his use of a curve against which batters were capable of making contact to increasing his use of a whiff- and take-generating curve. When we look to October and the postseason, as Darvish’s curveball rate plummeted, opposing batters began swinging at the pitch more often. When Darvish threw curves in the postseason, they weren’t generating the outcome associated with its success. The pitch he cut from his repertoire simply wasn’t as effective as the pitch he’d added back to it in August and September. 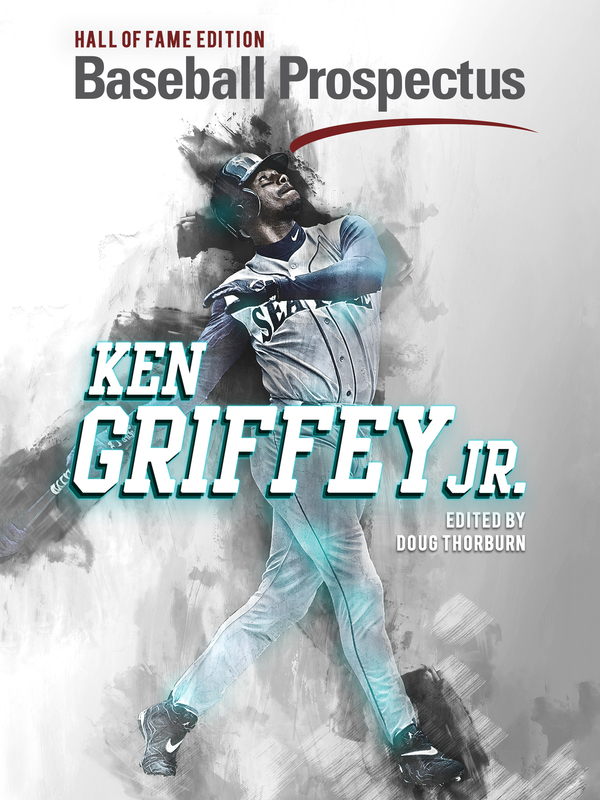 My conclusion is regrettably bland: when Darvish throws a curveball that generates fewer swings and more whiffs—that generates a lower contact rate—his outcomes and those of his other pitches are more effective than when he throws a curveball that generates more swings and fewer whiffs (or, a higher contact rate) and reduces its usage. Unfortunately, it’s never as simple as suggesting to a pitcher that he throw the good version of a pitch in place of the bad one. 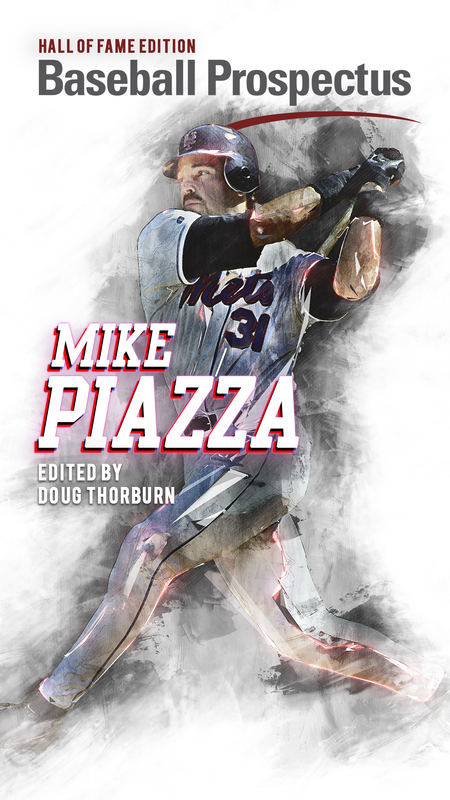 Sometimes pitchers lose feel or confidence in a pitch, or face an opponent against which they know it won’t be as effective—and adjust their pitch mix to compensate, rather than throw bad curveballs. Beginning in the final months of 2016, one pitch starts to act like an outlier on the horizontal release-point axis: the curveball. The separation continued throughout 2017—the good starts and the bad. I don’t know whether the change was deliberate or what role it did (or didn’t) play in periods when his curveball was more and less effective. 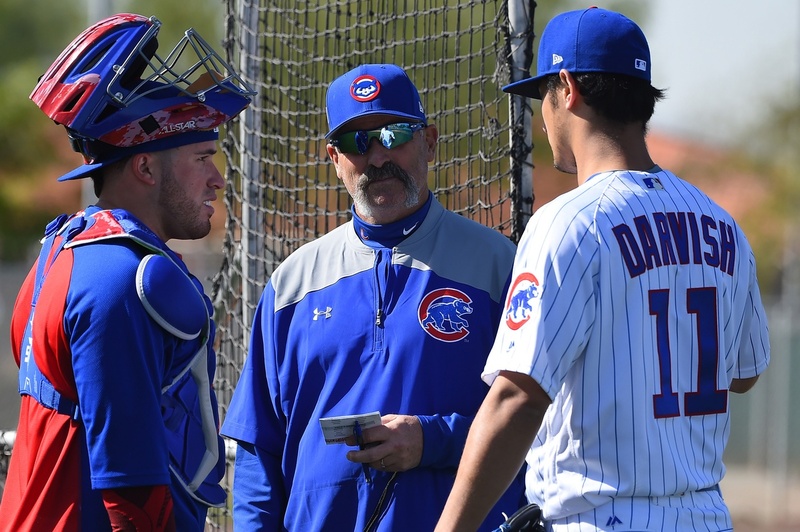 But since the elephant in the room when talking about Darvish’s 2017 rough patches is pitch tipping, the release point of one pitch—the same pitch about which a familiar catcher wondered aloud—suddenly becoming more distinct from the rest seems worth keeping an eye on.